The Coral Beach Hotel & Resort is situated on 500 metres of natural sandy beach with its own private harbour and boat. It is close to the town of Paphos, 25 minutes from Paphos International Airport and 150km from Larnaca International Airport. This unique resort combines the traditional Cypriot d�cor of white walls and authentic woodwork with the modern amenities expected of a five star resort. 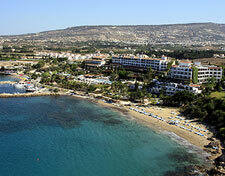 The resort is located on the edge of the Akamas peninsula, an area protected by UNESCO. Guests can enter Akamas and enjoy the breathtaking scenery either by horseback, 4x4 jeep or by boat. The town of Paphos has itself been added to UNESCO's World Heritage List since 1980. Paphos being the Roman capital of the island, there is an abundance of mosaics, archielogical sites and museums to visit all about a 10 minute drive away. At the Coral Beach Hotel & Resort there awaits an unforgettable array of dining experiences inspired by the world's great culinary capitals. There are six restaurants offering a selection of cuisines from Cypriot to French and from traditional fresh fish to romantic Italian. On those warm Paphos evenings, we propose a taste of the Cyprus Night with some delicious local dishes and wine from the Paphos vineyards, accompanied by traditional folk dancing at the Limani Taverna by the fishing harbour. All restaurants adjoin terraces, so breakfast, lunch and dinner can be taken outside. For our younger guests early meals are available. Please be advised that dining options and or outlets maybe limited, depending on season and weather conditions without prior notification. Rooms and suites at the Coral Beach Hotel & Resort have brought a new dimension to hotel design. Exclusively for guests appreciating real flair, rooms and suites are perfectly appointed, echoing centuries of culture within the hotel. All rooms and suites at the Coral Beach Hotel & Resort refect the local character, decorated with white walls and light colours ensure an island feel.